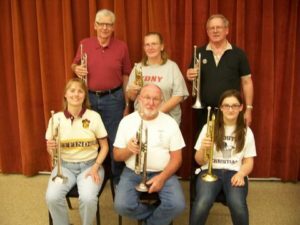 The Wayne County Historical Society Summer Community Band is looking forward to its first concert this summer. The band will be performing under the baton of Mr Randy Claes on Wed., June 15 at 7:00 p.m. on the campus of the Wayne County Historical Society. Also directing will be Michael Santmyer and Tim Wolf. The band will play in St. Mary’s Gymnasium (across Bowman St. from the Wayne County Historical Society) due to the weather. A second concert is planned for Thurs., July 21 at 7:00 p.m. in “Downtown Wooster” in front of “Everything Rubbermaid”. We will be playing “fun” songs – marches, show tunes, patriotic songs, etc. This band is an effort to remind us of the bands which many communities had back a hundred years or so ago. The Wooster Board of Trade Band with their concerts in the old bandstand in front of the now “Everything Rubbermaid” store was an example of this type of band. We greatly appreciate the wonderful cooperation of the College of Wooster Music Department and College conductors Nancy Ditmer, Jeff Lindberg, and Ned Brooks, Also appreciated is St. Mary’s Catholic Church for the use of their school gymnasium if needed!! A huge THANK YOU to a friend of the WCHS that is sponsoring the band for the fifth year and wishes to remain anonymous! The band is open to anybody that plays a band instrument (including percussion), young or not so young, experienced or not so experienced!! We range in age from 12 to 89 years young! We are pleased to have over 50 members in the band! Fifteen members of the band have college degrees in music (or are working towards a music degree) and an additional twelve members played in a college level band while they were in college. Band Manager – Jerry Payn at 330-345-5547 or gmpayn@sssnet.com.